In Canberra, there used to be a vegetarian restaurant called "Sesame" in Green Square in Kingston. This recipe is from their cook book. I've made this many times and even the boys like it (Jane). Tip: you'll need about 1 1/2 cups of vegetables per person. Vegetables listed here are just a suggestion. I love throwing in a few halved Brussels sprouts. Mushrooms are also a good addition. 1. 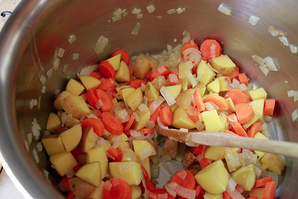 Sauté chopped onions until cooked, add garlic and carrots and potatoes and continue cooking for about 5 minutes. 2. 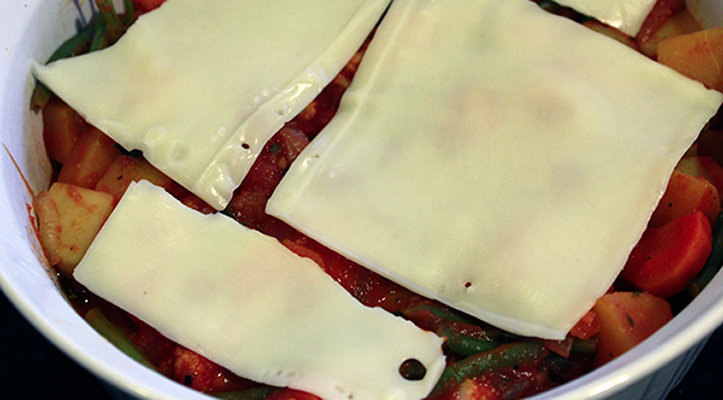 Add remaining vegetables, canned tomatoes, tomato paste and water as necessary to just cover vegetables. 3. Simmer until vegetables just cooked. Add salt and pepper and herbs. If you like a bit of spice add a chopped jalapeno or some sambal oelek. 4. For the topping - blend together the sour cream and eggs until combined and smooth. Add 1/2 teaspoon of salt and a good lot of freshly cracked pepper. 5. Pour the cooked vegetables into an over proof dish - or maybe two depending on how much you have made. 6. Place sliced cheese on top of the vegetables and then pour over the sour cream and egg mix. 7. Bake in a moderate oven (around 350F) for around 30 minutes. Topping will be bubbly. 8. Serve with some garlic bread and a green salad.